Fellow fans of Svengoolie, Universal Studios’ horror films and the iconic TV series “The Munsters” will be in for a treat this Sat. on Me-TV. 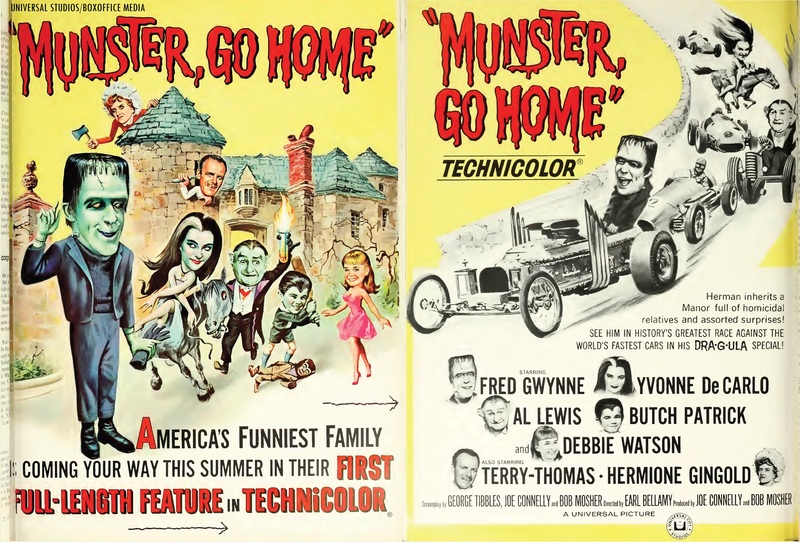 Sven will be presenting the 1966 film “Munster, Go Home!” this Sat., April 29 at 10 p.m. Eastern/9 p.m. Central on Me-TV. This isn’t the first time that the legendary Chicago-based horror host has shown “Munster, Go Home!” on Me-TV (from coast-to-coast). Sven had previously shown the cult feature-length Munsters film in July 2013, May 2014 and Nov. 2015. According to IMDB, Universal released the film to theaters on June 15, 1966. “The Munsters” TV series concluded on May 12, 1966 after two seasons on CBS (the final episode was “A Visit from the Teacher,” according to IMDB’s episode listings). “Munster, Go Home!” was directed by Earl Bellamy. Bellamy had directed seven episodes of “The Munsters” TV series. Fellow fans of vintage Universal horror films and Svengoolie will be in for a spooky treat this Sat. evening on Me-TV. NOTE: (The YouTube clip is a promotional ad for the United Kingdom Region 2/PAL Odeon DVD release of the 1943 Universal thriller). The legendary Chicago-based horror film host will be showcasing James Hogan’s 1943 thriller, “The Mad Ghoul,” this Sat., April 22 at 10 p.m. Eastern/9 p.m. Central on Me-TV. This isn’t the first time that Sven has shown “The Mad Ghoul,” he had previously showcased the 1943 Universal horror flick back in Sept. 2013 and Aug. 2014 on Me-TV. Fellow fans of Mystery Science Theater 3000 and RiffTrax will be excited this week with an upcoming live cinematic riffing event from coast-to-coast. RiffTrax, in association with Fathom Events and Cinema Epoch will be presenting RiffTrax Live: “Samurai Cop” in select cinema venues from coast-to-coast on Thurs., April 13 at 8 p.m. (local time). A pre-recorded encore presentation of the RiffTrax Live event will take place on Tue., April 18 at 7:30 p.m. (local time). The RiffTrax Live presentation will be broadcast to select theaters live via satellite from the Belcourt Theatre in Nashville, Tennessee. 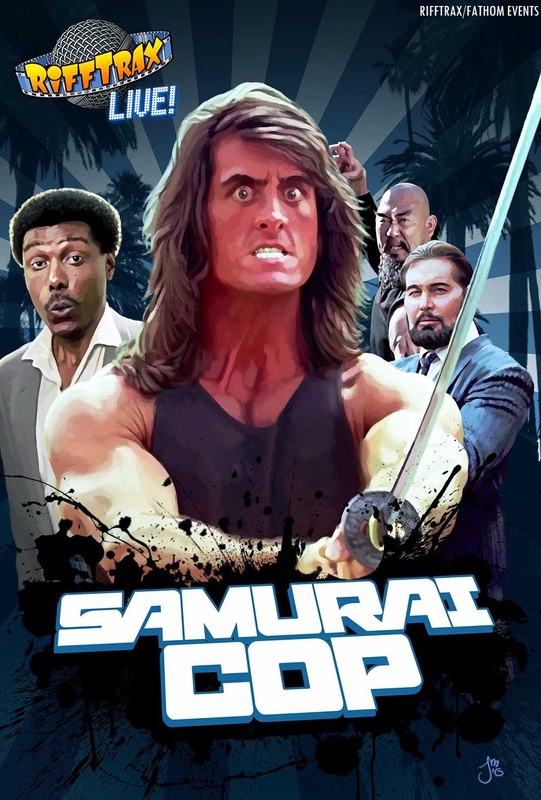 This hasn’t been the first time that Mike, Kevin and Bill have riffed “Samurai Cop.” The RiffTrax crew released their rendition of the low-budget cheesy action flick in March 2016. Robert Z’Dar (who played Yamashita in “Samurai Cop”) appeared in two Z-budget films that were riffed by Mike Nelson and the bots on MST3K, “Soultaker” (episode #1001) and “Future War” (episode #1004). Both “Soultaker” and “Future War” aired in 1999 during the show’s 10th (and final) season on the Sci-Fi Channel (now known as “Syfy”). Ed. Note/Sidebar: Due to the recent Me-TV affiliation switch in the Frederick/Washington area (Me-TV moved from WJLA-TV 7 to Fox O&O WTTG-5’s sub-channel, along with unsuccessful attempts at receiving WTTG and WBAL’s over-the-air digital signals for Me-TV), the local cable provider near the home office of “Silver Screen Reflections” has still not added WTTG’s new Me-TV sub-channel. After recent discussions with a rep from my local cable provider, they claimed that it would take a week for them to restore Me-TV to my cable lineup. I have also inquired the management of WTTG to see if they have worked out a deal with my local cable provider to restore Me-TV (as of this writing, I have not received any replies from the management of WTTG/Fox Television Stations). I do not want to miss out on Sven’s premiere of “Rodan” this Saturday (unfortunately, I missed out on his recent showcase of “Abbott and Costello Meet the Invisible Man”). I definitely do not want to miss out on another fun live-tweeting session during Svengoolie’s showcase (w/ fellow fans of Sven throughout the country)! Fingers crossed that Me-TV will be restored to my cable lineup soon (before Svengoolie and “Rodan” this Sat. night)! Now on to the article! –C.H. Fans of “Svengoolie” and Toho Studios’ “kaiju” monster films will be excited when he will showcase another cult gem featuring another creature of Japanese cinema. Poster for the North American release of Toho Studios‘ “Rodan” (1956). The beloved Chicago-based horror host will be showing Toho Studios’ 1956 kaiju classic, “Rodan” this Sat., April 8 at 10 p.m. Eastern/9 p.m. Central on Me-TV. “Rodan” was directed by Ishiro Honda, who also directed Toho Studios’ legendary kaiju creature film, “Godzilla” (1954, released in the United States under the title of “Godzilla: King of the Monsters!” in 1956. Sven showcased the 1956 North American dub of Honda’s “Godzilla” during his festival of Godzilla flicks back in Feb. on Me-TV). 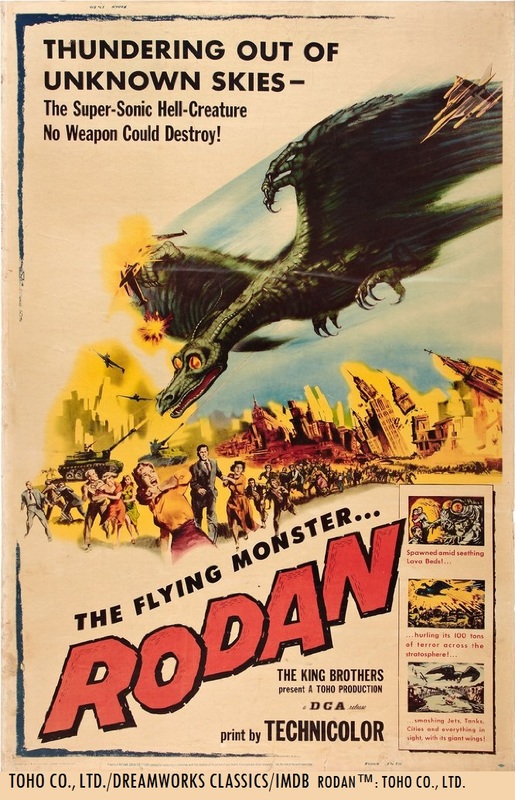 According to IMDB, Honda’s “Rodan” was released to theaters in Japan by Toho in December 1956. The dubbed version of the film was released to cinemas throughout the United States in August 1957 by the Distributors Corporation of America, or DCA (RKO Radio Pictures handled the distribution of Toho Studios’ “Rodan” in other territories). Who was in “Rodan” (1956)? The actors who appeared in “Rodan” were Kenji Sahara (as Shigeru Kawamura, Sahara was credited as Kenji Sawara), Yumi Shirakawa (as Kiyo), Akihiko Hirata (as Professor Kyuichiro Kashiwagi) and Akio Kobori (as Officer Nishimura).